The 25th edition of the Fleadh begins today Tuesday July 9 and ends on Sunday, the 14th. In these few days there are many interesting films, within the sections of Animation, World Cinema, New Irish cinema and Documentaries, the guest country is Luxembourg, and as the guest of honor the great Saoirse Ronan in an open interview on Sunday 14 in the Town Hall Theatre at 3 pm. 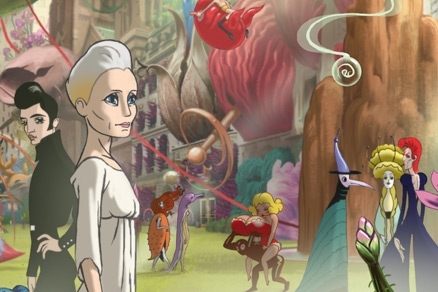 An impeccably realised and mind-blowingly successful hybrid of live action and animation, The Congress is a beautiful exploration of human relations, Hollywood ageism and life in the digital age. Mixing trippy, Yellow Submarine-esque surrealism, Fleischer Studios Betty Boop-style pieces and the narcotic-fuelled aesthetic of Ralph Bakshi to examine these issues, The Congress manages to seem at once ahead of its time and resolutely relevant to the world we live in today, while simultaneously paying tribute to the craft of animation. A must see. A story of family revelations, people finding each other and letting each other go, looking for love where they’ve found it before and, when that doesn’t work, figuring out where they might find it next. At once emotionally charged, formally abstract and narratively laidback, Matt Porterfield’s third feature, following Hamilton andPutty Hill, continues his fiercely independent, realist oeuvre. Heathers is a cult classic ten years ahead of its time. Think Mean Girls (2004) meets Full Metal Jacket (1987) and you’ll begin to scratch the surface of this epically dark comedy. In fact, the script was meant for Stanley Kubrick. Perhaps the greatest High School comedy of all time, Heathers is satire of the highest caliber. Winona Ryder, in her first post-Beeltejuice (1988) role, delivers insane, acerbic dialogue that would be lost on a lesser talent. Accompaning six strangers from around the world as they attempt to walk across Spain with only a backpack, a pair of boots, and an open mind. Whatever their motivation, no one can predict just how their paths will unfold, what personal demons or angels they will face, or what transformations they will undergo by trail’s end. Driven by an inexplicable calling and a sense of adventure, they throw themselves into both their physical trek and their personal pilgrimage.